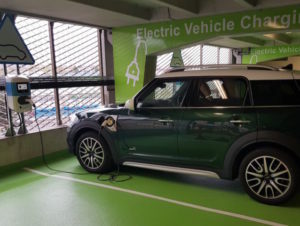 The MediaCityUK creative and digital hub in Manchester has deployed 10 GeniePoint Network connected chargers from ChargePoint Services to enable the use of electric vehicles by drivers travelling to or living at the development. Situated on the banks of the Manchester Ship Canal, MediaCityUK is a joint venture between Peel Land and Property Group and Legal and General Capital, and is home to the BBC, ITV, Kellogg’s, Ericsson and the University of Salford, as well as over 250 smaller businesses. In total, around 7,500 people now live and work within MediaCityUK. The 10 22kW fast chargers are situated on the second floor of the multi-storey car park within the site and can be accessed via an RFID card or the GeniePoint Network mobile web app. They’re also supported by ChargePoint Services’ 24/7 customer service centre. The installation of the chargers is the first phase of a project between Peel Energy and ChargePoint Services that will connect Peel Land and Property’s developments to the nationwide GeniePoint Network.